The Oregon Treaty is a treaty between the United Kingdom and the United States that was signed on June 15, 1846, in Washington, D.C. The treaty was signed under the presidency of James K. Polk, the treaty brought an end to the Oregon boundary dispute by settling competing American and British claims to the Oregon Country; the area had been jointly occupied by both Britain and the U.S. since the Treaty of 1818. The Treaty of 1818 set the boundary between the United States and British North America along the 49th parallel of north latitude from Minnesota to the "Stony Mountains" (now known as the Rocky Mountains). The region west of those mountains was known to the Americans as the Oregon Country and to the British as the Columbia Department or Columbia District of the Hudson's Bay Company. (Also included in the region was the southern portion of another fur district, New Caledonia.) The treaty provided for joint control of that land for ten years. Both countries could claim land and both were guaranteed free navigation throughout. Original manuscript of the treaty (transcription), as kept by the U.S. National Archives. Joint control steadily grew less tolerable for both sides. After a British minister rejected U.S. President James K. Polk's offer to settle the boundary at the 49th parallel north, Democratic expansionists called for the annexation of the entire region up to Parallel 54°40′ north, the southern limit of Russian America as established by parallel treaties between the Russian Empire and the United States (1824) and Britain (1825). However, after the outbreak of the Mexican–American War in April 1846 diverted U.S. attention and military resources, a compromise was reached in the ongoing negotiations in Washington, D.C., and the matter was settled by the Polk administration (to the dismay of its own party's hardliners) to avoid a two-war situation and a third war with the formidable military strength of Great Britain in less than 70 years. The treaty was negotiated by U.S. Secretary of State James Buchanan, who later became president, and Richard Pakenham, British envoy to the United States and member of the Privy Council of the United Kingdom for Queen Victoria; the Earl of Aberdeen was at the time Foreign Secretary, and it was he who was responsible for it in Parliament. 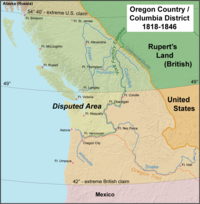 The treaty was signed on June 15, 1846, ending the joint occupation with Great Britain and making most Oregonians below the 49th parallel American citizens. The Oregon Treaty set the U.S. and British North American border at the 49th parallel with the exception of Vancouver Island, which was retained in its entirety by the British. Vancouver Island, with all coastal islands, was constituted as the Colony of Vancouver Island in 1849. The U.S. portion of the region was organized as Oregon Territory on August 15, 1848, with Washington Territory being formed from it in 1853. The British portion remained unorganized until 1858 when the Colony of British Columbia was declared as a result of the Fraser Canyon Gold Rush and fears of re-asserted American expansionist intentions. The two British colonies were amalgamated in 1866 as the United Colonies of Vancouver Island and British Columbia. When the Colony of British Columbia joined Canada in 1871, the 49th Parallel and marine boundaries established by the Oregon Treaty became the Canada–US border. Navigation of "channel[s] and straits, south of the forty-ninth parallel of north latitude, remain free and open to both parties". The "Puget's Sound Agricultural Company" (a subsidiary of the Hudson's Bay Company) retains the right to their property north of the Columbia River, and shall be compensated for properties surrendered if required by the United States. The property rights of the Hudson's Bay Company and all British subjects south of the new boundary will be respected. Ambiguities in the wording of the Oregon Treaty regarding the route of the boundary, which was to follow "the deepest channel" out to the Strait of Juan de Fuca and beyond to the open ocean, resulted in the Pig War, another boundary dispute in 1859 over the San Juan Islands. The dispute was peacefully resolved after a decade of confrontation and military bluster during which the local British authorities consistently lobbied London to seize back the Puget Sound region entirely, as the Americans were busy elsewhere with the Civil War. The San Juans dispute was not resolved until 1872 when, pursuant to the 1871 Treaty of Washington, an arbitrator (the German Emperor) chose the American-preferred marine boundary via Haro Strait, to the west of the islands, over the British preference for Rosario Strait which lay to their east. The treaty also had the unintended consequence of putting what became Point Roberts, Washington on the "wrong" side of the border. A peninsula, jutting south from Canada into Boundary Bay, was made by the agreement, as land south of the 49th parallel, a separate fragment of the United States. ^ "Convention of Commerce between His Majesty and the United States of America.—Signed at London, 20th October 1818". Canado-American Treaties. Université de Montréal. 2000. Archived from the original on April 11, 2009. Retrieved 2006-03-27. ^ Walker, Dale L. (1999). Bear Flag Rising: The Conquest of California, 1846. New York: Macmillan. p. 60. ISBN 0312866852. 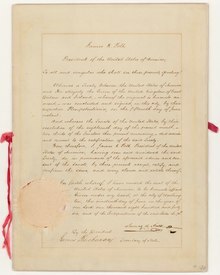 ^ "Treaty between Her Majesty and the United States of America, for the Settlement of the Oregon Boundary". Canado-American Treaties. Université de Montréal. 1999. Archived from the original on November 13, 2009. Retrieved 2007-01-12. Winston S. Churchill (1958). The Great Democracies. A History of the English-Speaking Peoples. 4.